1. Launch the Android SDK and AVD Manager from within Eclipse by clicking on the little green Android icon with the arrow ( a ) on the toolbar. You can also launch the manager by selecting Window, Android SDK and AVD Manager in Eclipse. 2. Click the Virtual Devices menu item on the left menu. The configured AVDs will be displayed as a list. 3. Click the New button to create a new AVD. 4. Choose a name for the AVD. Because you are going to take all the defaults, name this AVD VanillaAVD. 5. Choose a build target. For example, to support Android 2.1, choose the item build target called Android 2.1 - API Level 7 from the drop-down. 7. Choose a skin. 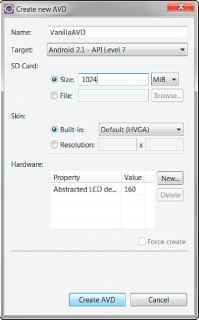 This option controls the different visual looks of the emulator. In this case, go with the default HVGA screen, which will display in portrait mode. Your project settings should look as shown in Figure 1.4. 8. Click the Create AVD button and wait for the operation to complete. Because the Android Virtual Devices Manager formats the memory allocated for SD card images, creating AVDs with SD cards may take a few moments. Creating a new AVD in Eclipse.